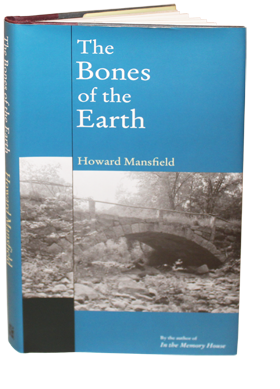 In Part One of The Bones of the Earth, “Axis Mundi,” Howard Mansfield writes about how we choose the landmarks of our home place. He explores our allegiance to stone in the monuments of grief, and in unusual old bridges on back roads, which were built without mortar: “One part ancient engineering, one part farmer’s wall.” He visits monuments minor (prized walking canes), unexpected (radio telescopes), and famous (the Washington Elm, whose story is wrong about the facts, but right about the truth). Part Two, “Flaneurs,” teaches us to be tourists of the near-at-hand, looking close to home at changes in the land both man-made and natural. And in Part Three, “Rpm,” Mansfield describes the forces that topple our original axis mundi, unsettling us and the land as building booms and asphalt connect people in unexpected ways. Howard Mansfield explores the loss of cultural memory, asking: What is the past? How do we construct that past? Is it possible to preserve the past as a vital force for the future? Eloquently written, The Bones of the Earth is a stunning call for reinventing our view of the future. This is a book about landmarks, but of the oldest kind—sticks and stones. For millennia this is all there was: sticks and stones, dirt and trees, animals and people, the sky by day and by night. This was the world's order by day and by night in dreams. The Lord spoke through burning bushes and rocks, though lightning and oaks. Trees and rocks and water were holy. They are commodities today and that is part of our disquiet.